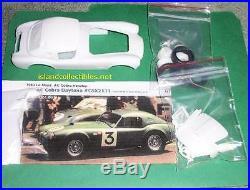 This is a nicely detailed cast resin unbuilt 1/25th scale model TRANS kit of the 1963 Lemans AC Cobra hardtop. This style body ran at Lemans but no decals are included however they might be available from Fred Cady. 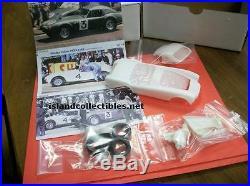 This kit is made by Historic Racing Miniatures and will convert the AMT plastic kit into the LeMans car. The casting quality is excellent. We at Island Collectibles are authorized dealers for HRM so if there are any problems we will correct it. They are for demonstration only to show what it can look like built. Thank you and good luck. The item "HRM 1/25 AC COBRA HARDTOP LEMANS 1963 DETAIL RESIN TRANSKIT FOR AMT" is in sale since Sunday, August 06, 2017. This item is in the category "Toys & Hobbies\Models & Kits\Automotive\Sports\1/25 Scale". The seller is "ed427vette" and is located in Massapequa Park, New York. This item can be shipped worldwide.